Westbourne held its first ever Christmas Fiesta of Lights on Saturday, 3 December. It included LED balloons, UV lights, glow paint, fire shows, live music, performers and dancers. The entertainers wowed the crowds giving a unique and magical approach to the annual switch on. Visitors joined shops and businesses as they kick-started Christmas together alongside the Mayor and Mayoress of Bournemouth. Conor Burns MP and Cllr John Beesley welcomed Santa as he arrived in style with his elf driving an open topped Bentley, to cheers from the crowd despite the cold winters morning. The dignitaries visited an array of shops and businesses. Families gathered to meet Santa and whilst waiting they were entertained by stilt walkers and face painters, as well as choirs and singers. 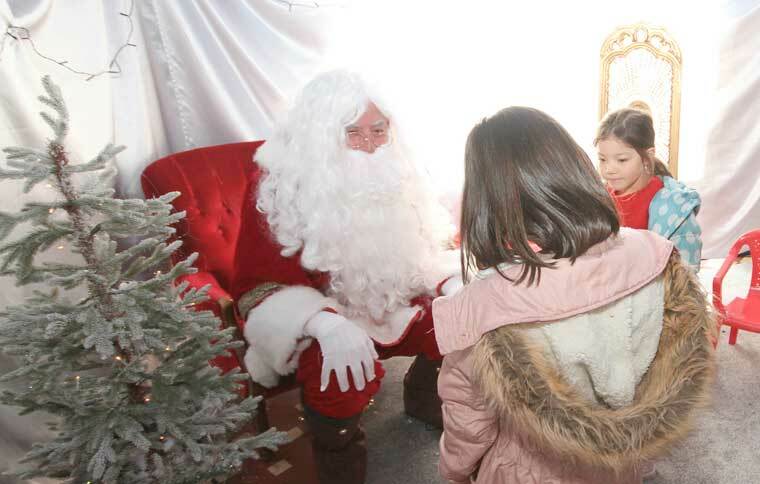 Santa will be based in the Westbourne Arcade every Saturday from 10am-4pm in association with Westbourne Rotary. the cost is £4 with monies raised going to charity. Peter Treble Butchers on Poole Road hosted its annual 12-inch sausage eating competition which raised smiles and lots of laughter, as Miss Galaxy and the president of the Westbourne Business Association and Coastal BID director, and director of A-One Insurance Group Lia Martin also joined in the fun alongside other contenders. Every Saturday the shops and businesses are offering free tastings, special offers and activities. Chester Pearce Funeral Services have a special ‘memory tree’ so shoppers can post a leaf on the tree in remembrance of loved ones past. The free ‘Follow the Star’ competition, starting and finishing at Life and Sole in Seamoor Road, gives children a chance to win their very own limited edition Love Westbourne teddy bear. There is a selfie competition at www.facebook.com/westbournebusiness and local councillor and author Nick Rose will be signing his children’s books in the Arcade on 10 December from 12–2pm. Jamie Jigsaw will entertain on 17 December 10am–2pm plus there will be free pop up activities on 10 and 17 December. Late night shopping in the Arcade is every Thursday evening.